The issuance of this study comes in the frame of ANHRI’s continued effort to defend the freedom of expression and to call on providing the legislative environment that protects the freedom; Freedom of Expression comes at the top of it. As the freedom of expression is the foundation stone to build a society in which its citizens enjoy their basic rights. The international covenants and treaties that provided on the necessity of protecting and guaranteeing such rights and to cope with the new fact excreted by the Egyptian revolution and it became a basic necessary that can’t be waived. While the legislative heritage deep in the long history of the Egyptian state. It carries variations in its texts that reflect the variations within the stages of history that reach contradiction. The clear attribute, which could constitute a common factor between these stages, is the arbitrary restrictions on the right of the citizens to freedom of publicly express their thoughts, opinions and believes, through journalistic or literary writing in addition to the different kinds of artistic creativity. It should be noted that the Egyptian legislator under the pressure of the successive powers, since the Ottoman empire through the rule of Mohamed Ali’s family and until the military rule after the revolution of July 1952, didn’t find necessity, in most of times, to repeal such inherited laws from the previous eras, in relation with the punishment on the exercises of freedom of expression. The legislator efforts focused on adding more restriction and expanding the scope of accusations. In addition to this persistent accumulation to the articles that restrict the freedoms, which come back to the era of Ottoman empire and the British occupation, a lot of the Egyptian laws articles tend to generalization and ambiguity in specifying the causes of the penalty or the legal concepts that in case of violation the penalty shall apply. The Egyptian legislator was fond of, in the different eras in our modern history, using the concepts such as public decency, public security, national peace, public ethics and other elastic concepts and expressions that can’t have precise and clear definitions with limits, which allow the authorities assigned to execute the law unlimited space to interpret it according to the said authorities. It is still used until today to pursue different purposes; political, personal and others, that make the law a tool to intimidate and prosecute the opponents or who disagree in the opinion or belief instead of guaranteeing the protection of the citizens and their rights. These and other problems in the Egyptian laws in respect of addressing the freedom of expression, require to review the laws and purify it of what contradict with the spirit of the age and with the international obligations of Egypt which represented in the treaties and charters of human rights signed by the Egyptian state and before all of that what contradict with the rights and freedoms of the Egyptians. To achieve such purpose, this study is issued by ANHRI, it addresses seventy seven articles relevant with the freedom of expression, press and punishment. These laws are; penal law, establishment of the journalists’ syndicate, law on regulating the press, Regulating the press law, statictis and census law, Telecomunication regulation law, Censorship on the artworks. 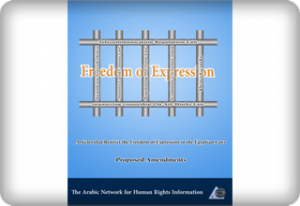 The study presents the laws that restrict the freedom of expression in these laws and present proposals to repeal some of it and amend others in order to achieve the right of the citizens in expressing their free opinion without being arbitrary detained. The study was prepared by the lawyers of the legal aid unit in ANHRI, depending upon searching in the different Egyptian laws and comparing it with the similar legal articles in the different countries in addition to the accumulated experience they have in defending the opinion-makers, journalists, media-professionals, creators and bloggers who were harassed by these laws during the years of ANHRI work in the human rights field. ANHRI as issues this study, recognizes that the purpose of providing a legislative environment that protect the rights and freedoms, requires concentrated efforts from the civil society organizations, opinion-makers, creators and the institutions that represent them. ANHRI hopes that this study could add value to these efforts of supporting the democratic society, in which its citizens enjoy the right to expression. The journalists, writers and stakeholders could have a printed copy from the study from ANHRI’s headquarter in Arabic or in English.